Having four children, I should be old hat at the dreaded teething stage. This doesn't stop me trying out the latest methods. Anything for a peaceful nights sleep. Something that I wish I had tried sooner is amber. This was something I discovered with my third daughter. I was recently given the chance to review some amber anklets and with Layla cutting her back teeth I was very keen to try them. So how does the amber work? It contains small amounts of a succinic acid, this is well known to act as an anti-inflammatory and pain reliever. It is the warmth of your little ones skin that when against the amber releases the succinic acid which is then absorbed into your baby's blood stream. Amber Anklets are priced from as little as £9.99 each. Measuring 14cm long and fitted with a screw clasp with each stone being individually knotted for your child's safety. I received the anklets in the multicolour and lemon colour ways. As Layla already had one anklet I decided keep one and give the other one to my friend for her newborn daughter. The anklet itself was easy to do up and undo and the amber certainly allowed Layla to have a better nights sleep. 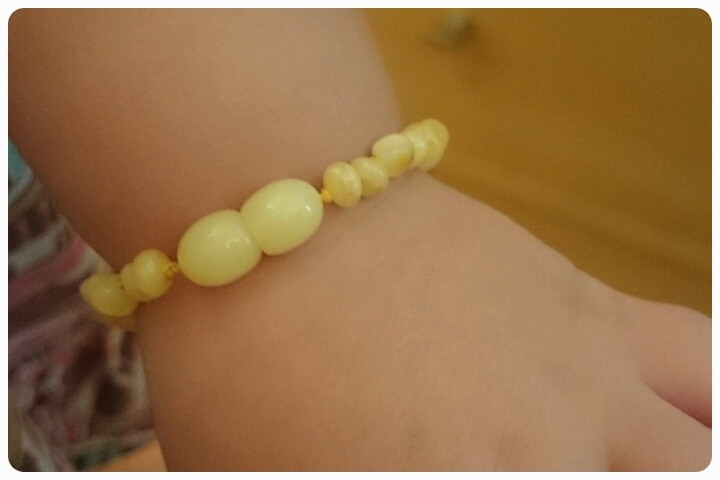 I also love that it could be kept on as jewellery after teething has subsided. The problem I found was the actual size of the anklet. I ended up having to put it on Layla's wrist as it wasn't long enough to do up around her ankle and people who know my daughter know that she is a tiny little thing. It would be nice if the anklets were available to purchase in different lengths or perhaps made adjustable so that they would last longer. Overall a lovely product that is great natural way of treating the symptoms of teething. Disclaimer : I was sent this product for for reviewing purposes however all thoughts and opinions are my own. I am definitely thinking of giving amber a go for when our little one is here. I know my sister in law used amber necklaces on her 2 boys which seemed to work.